I am a dedicated declutterer. I didn't always used to be. I had report cards from aged 6 even when they weren't very complimentary. I stockpiled letters from people from people I couldn't even remember. I had clothes back to the sometimes embarrassing 80s that I wouldn't wear today but kept. I would buy a beautiful new journal/notebook on a whim despite having loads unused at home. I would buy quilting books for lovely quilts, despite having piles at home whose techniques I never used. I would buy fabric because "that is lovely" and stuff it into drawers of years of fabric I bought because it is "lovely". I was stockpiling things to do, things I must do, to ensure I never felt good about achieving one thing, because there was always a list of things I had bought to do and hadn't. Is this a problem? Well no, not if you can happily start a project and finish it and don't feel guilty because of the piles and lists of things waiting in the background for you to finish. If you do feel guilty, if you have a harking suspicion that those piles prevent you from enjoying the moment, from embracing the project you are working on now, then it is a problem. And you wouldn't have jumped onto Leah's UFO Sunday like Babe tucks into potato peels. Lay out ALL quilting projects - this includes EVERYTHING, quilts in the drawing stage, fabrics put aside for a project, started blocks, applique, finished quilt tops but not sandwiched, sandwiched but not quilted, half quilted, quilted but not bound. Think about appropriateness. If you have a quilt started 10 years ago for a baby that is now totally inappropriate for their age, mark it as "this will not do for Mary". Look at the piles and think about how YOU feel about the quilt. Do you now dislike the fabric, the design, the person for whom it was meant? Examine your own feelings about the UFO - does it make you feel ill to look at it, does it represent an attempt at a new technique that you struggled with, failed at, cried at. Or does it make you feel excited as in "I really want to do this"". Make no decisions as of yet. By now UFOs have moved from pile to pile to pile - early beginning but excitement at the thought of proceeding with them, nearly finished but make you reach for "quilter's helper" (wine) at the thought of them. Some projects are a long term WIP and shouldn't be confused and negated by putting it in the UFO pile. Two years about I cut out 49 12" blocks of plain flannel, red on one side and warm cream on the other. I sandwiched them. They are a quilt as you go project called my "Life" quilt. I hand quilt it with simple designs that represent a part of my life and the people in it. I decided that this would be a travel project. At the time I was travelling a lot around Asia for work, so taking a block along meant I could happily quilt on a plane while watching a movie. I don't travel for work now and get the project out once a year for when I go home to Ireland, 13 hours on the plane go by quickly as I stitch away. My friend is hand sewing a Jane Austen hexagon quilt. She sews it when she is on a plane, away on a chilling holiday, when she gets tired of a project she is working on and wants an excuse to watch Harry Potter. She's been at it for years now and is still happily working away from time to time. Both of these projects have no deadline and are works in progress. They cause us no angst or guilt when we think about them. They see the light of day at least a couple of times a year. I figure if I continue sewing just two blocks a year on a long haul flight then it will be on the go for another 20 years. I'm happy with that. If a project is sitting in a drawer for a year with no progress and it makes you "itchy" to think of it it is a UFO. What about the two projects I thought about (as a way of procasternation about my Mariner's Compass UFO), designed and cut out the fabric before firmly putting them away. Are they UFOs? Really they are BUT I made the decision to decide they are not. They are potential projects. I don't have to use the design I thought of, I don't have to use the fabric's I cut out for that quilt and I only ever said I would make Mary (actually Mary got her quilt years ago) a quilt in my mind. So I put away the pieces into a small package and will use them one day, maybe for a quick emergency quilt, maybe in another round robin. They are potentials. So UFOs are projects in any stage which make you feel guilty, anxious, unsatisfied or slightly negative in some way. Often they represent money. Money spend on fabrics that are not being used and make you feel guilty about buying more fabrics. Or simply they clutter up your space inhibiting the creative flow and you just want them gone/finished/sorted. So now you have your group of UFOs, how could you tackle them? Seriously if you have quilts that just need to be bound, then bind them and send them on their way. If binding is a mental block to you, then take the challenge and get them done. Not binding a quilt is like having a letter in an envelope, address written, stamp put on but you just can't take that step to get to the post box. You don't have to hand bind, embrace Leah's machine binding. Also the plus side is that scraps of fabric/stash make great binding. There are plenty of quilt shops/groups that gladly take fabric, assortment of blocks, half finished quilt tops to finish as quilts for charity. If you have something that just won't work for Mary (because she is now 16 and Sunbonnet Sue is SOOOOOOOOOOOO lame) and you really don't like it anymore because your taste in fabric, your standards in quilting, your choice of colour have changed over the years - give it away. Explain to Mary that she is going to get a graduation quilt (that gives you 2 years of breathing space) and give the quilt in whatever state away. IF you still like the fabric/pattern/colour then decide to give it to someone else's baby. If there is no baby on the horizon, then put the project in whatever state it is in a bag (I love using sandwich bags), with all assorted fabric needed to finish it and put it away in the Quilts Waiting for a Home drawer - no longer a UFO but on pend with a clear decision that it will be finished when the occasion arises. But you have to use it for the next baby - no exceptions. Otherwise just give it away, there is a baby/child out there somewhere who will love it. Even if it was a quilt meant for an adult. We tend to believe that we must struggle through the endevour. This is not always the case. Sometimes we were just not ready to try Hawaiian applique and we don't need to keep the reminders of an early struggle around to negatively impact a future attempt when you are ready for it. So as horrific as it sounds just dump it. Yes, get rid of the crumpled, half unpicked mess. And by doing so you could leave your imagination to joyfully soar towards a new attempt. What can you farm out? The year after I promised to make 9 quilts, I was left with 3 mostly finished quilt tops. I was aware that the kiddies were waiting patiently for them, looking at siblings snuggled into their own finished quilts. I knew I was in an emotional state where I just couldn't face those last finishing touches to the tops, then sandwich them, quilt them and bind them. I still loved the quilts, I wanted them to be given to their owners and I knew that one day I would finish them but I didn't want the kids to wait and I didn't want to find I had the energy to finish them but that they had been so long in the UFO pile that I hated to look at them. So I agreed to myself that I would finish the tops and send them out to be sandwiched/quilted/bound. It took a lot of internal debate. I felt guilty I won't deny it. It felt like cheating, it felt wrong. There seemed to be some covenant somewhere that I had signed into that stated it would only be a meaningful gift if I did it all myself. But I made the decision and did it anyway. The kids got their quilts and were happy and I relieved myself of a self imposed burden. Once the quilts came back I was happy I had made that decision - they were quilted by someone else and it doesn't matter now 10 years on. One of them was a border round robin quilt for me and I've slept under it for years now and don't think about someone else finishing it, I just think of it as mine. Hopefully now you are left with a much smaller pile of manageable UFOs. The key decision is now what is important to you, what would make you happy? Quilting is your hobby not someone elses. The main point of a hobby is that it does good things for you, not for people who might benefit from the outcome of that hobby. What techniques do you want to practise? What is making you excited in the quilting world? Get to the point where you get to do what you want to do. When I was facing 4 UFOs at the beginning of the year, most of them were in blocks. I really wanted to practise free motion quilting and get better at it. I thought the best way to do this was to have projects lined up ready to quilt in a row. So I tackled each quilt top until they were all sandwiched and ready to quilt. This really put the ooomph into finishing the tops and I did that faster then if I tackled them one at a time to completion. This satisfied my own want but also gave me the impetus to get the projects quickly to where I needed them to be. Those blocks sat in my drawers for years, but I had them sewn into quilt tops and sandwiched in a month. And the quilting was fun. Decide which is more important to you right now. Finishing quilts for other people, finishing quilts for yourself. Will it help with inspiration and self esteem to finish promised quilts first or is it now time for you to focus on yourself? What makes it more enticing to get started and finished on the UFOs? Think about how you work best - facing the difficult quilts and getting them worked on first, or going for the easier ones to get the "finishing" habit in place. Maybe an assembly line way of working suits you. Finish all piecing for all UFOs, then sandwich them all, then quilt/bind, or you need to work through each project methodically until finished and then start on the next one. When looking at what you want/need to tackle, think about simplifying the quilt to get it finished. Had you planned to do a 49 block ocean waves quilt and have made only 16 of the blocks? Why not decide to use what blocks you have and use a single fabric to pad out the rest of the top? You might find playing around with and redesigning the quilt puts new life into how you look at it and suddenly you are all excited to get going again. It doesn't matter if you have all the other triangles cut out, you can put them aside for another project in the future. And all that negative space will be a joy to quilt. Stuck at the quilting stage, been stuck at it for ages? If this is a quilt you want to get out the door so you can move forwards with other projects, you could do a lot worse then stippling the whole thing. I did this at the beginning of my free motion quilting training. It was speedy and satisfying and I loved the feel afterwards. And I grew in confidence, what is any free motion design but stippling in different shapes. If you look at some of the modern quilts it is amazing how stunning simple squares of just the right colour can look placed interestingly on a background of negative space fabric and how simple quilting lines can just pop. Stuck with a design problem on a quilt you really want to do? Put it aside to germinate. Get all the other UFOs out, maybe try techniques you want to use on those other quilts. Then when you are ready the design will flow. Be realistic and look at all the UFOs and what needs to be done and think about how long it will take REALLY. Think about how you sew. If you are lucky enough to have a space that is permanent, then it is easy to leave a project by the sewing machine and sit down for short periods regularly. A quilt can progress really quickly by just putting 20 minutes a day into it. And the process is more fun, at least for me. Stop before you get tired and are still enjoying the process and things are going well. Be over generous with the amount of time you think it will take to finish each quilt, makes you feel really good if you finish early and allows for the rest of life getting in the way and stops you feeling once again you've let yourself down and got behind schedule. Be clear and honest to yourself about how long it will take you to clear every UFO. Put all but the project you are working on away. Don't depress yourself with piles of projects at varying stages of completion all glaring at you asking "why aren't you working on me?". If you have a design wall put something up that is inspiring. A quilt you have finished maybe and you love. Make your quilting space as enticing as possible no matter how small it is. If your space is a temporary one that needs to get set up and then cleared away, like the dining/kitchen table, try to make your set up easy - have everything you need to get moving on the project in a bag so it is quick and easy to set up and put away. People get engaged, have babies, have an unexpected loss, graduate. For babies you at least get 9 months to make the quilt and most people give a lot of notice for weddings. Unexpected losses are a different matter. My sister's husband died unexpectedly in March and after about a week I knew I wanted to make her a nap quilt as an expression of love. I tried and tried and tried. Rushed, and rushed and pushed and in the end made two dreadful quilt tops and had to destroy them. I then realised that I needed time to grieve and that I wasn't emotionally ready to make a quilt for her and that in fact, despite being a quilter and that's how we show our love, I could help her in other ways, phone calls, contact and support. 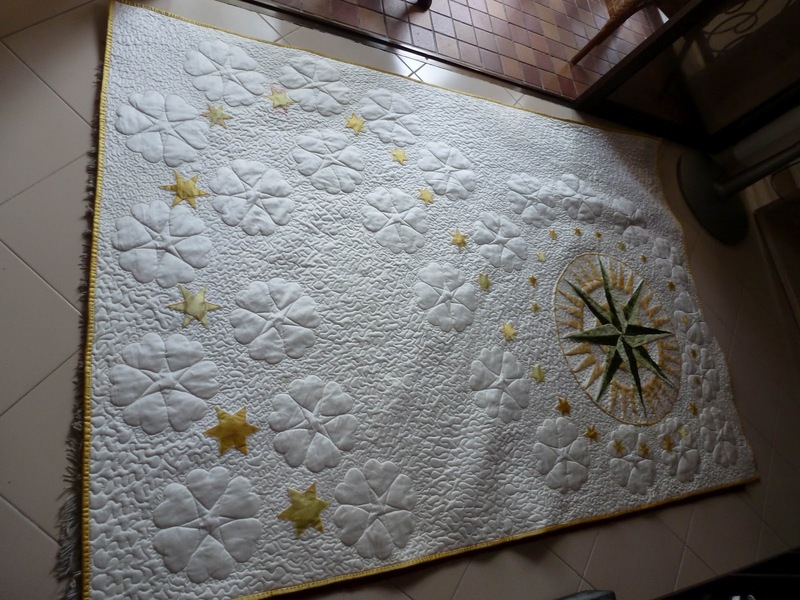 In July I took out part of the quilt that I saved, the Mariner's Compass, and knew exactly what I wanted to do and finished the quilt quickly and with ease and love. This leads on from why you have so many UFOs, why you can't finish one project before starting another, and why you quilt. Why did you start quilting? Because you thought "here is a quick, easy and cheap way to make gifts for people?". I doubt it, it is a great bonus of being a quilter but it is easy to get sucked in by family and friends asking "when will I get one of your quilts?" and feeling that as a quilter you must honour an occasion by making a quilt. Buy the baby a present, get the happy couple some candlesticks. If it is someone you really do want to make a quilt for (and remember this is for those of us with UFO's hanging out of our eyeballs), then tell them "I want to make a quilt for your wedding/baby but it won't be ready for the date", be really clear you want to have the time and space to make the quilt for them you really want them to have and that needs to you to quilt clutter free. They'll be thrilled anyway and be happy to wait. If for whatever reason, and this goes back to being prepared for the unexpected, you need to make the quilt immediately, then make it simple and vow that this is just a small detour before getting back to the UFOs. Don't start it if you feel that you are going to add it to the UFO list. Sometimes as quilters we tend to feel everything needs to be complex and we forget how beautiful the simplest quilt can be. Or be crafty and use one of your UFOs - that's killing two birds with one stone. Basically stop making quilts for everyone at the drop of a hat. A quilt made by you is precious and needs to be earned by years of begging/favours/compliments by a possible recipient. So now you are organised, you've faced your quilting demons and got every possible variation of a UFO out of the closet, you know how long it will take you to finish them all, and in what order you want to tackle them. Now you have to do it right? Making the plan and getting organised feels great but you still have to start and suddenly the whole thing just feels like a boulder resting on your shoulders and all you want to do is just start a new project with fresh, crisp fabric. Leah mentioned this as Key 1 and I agree with that, but it is a repeatable vow so keep on making it. Vow to clear all UFOs in the time you now know it will take to get them done. I started 2012 with the vow of no more new quilts until I finished the 4 UFOs I had waiting and the round robin Mama Africa which will come home in early October to me. Although I made two other "emergency" quilts, I started/finished them and got them to their new owners and got back to my UFOs. When I had the little madness session of thinking of 4 more quilts I wanted to make and even started cutting out the fabric for them, I made another VOW. 2013 would be the year of those 4 quilts. I could plan and design them now, adjust the designs and readjust during 2014. I would have fun with them and think of new techniques I could try. I also re-vowed to use as much stash as possible in my quilts. I had sorted out stash in the same way I recommend sorting out UFOs and gave a lot away and kept only fabrics I loved. So I looked at my stash again and sorted out what fabrics could be used for projects. I had some fabrics left over that just didn't fit together. They were orphans and yes I could go to the quilt shop to find matches but I already had enough fabric in my stash to make another 10 quilts so what was the point in that. So I gave those away. All I have left now are yummy fabrics that are possibles in new quilts and I can't wait to get stuck in to decide how to use them - in 2013! There are so many reasons, all of them personal to us all. For me it was a number of things, and this applies to stash as well. I'd gotten into the habit of always having a list of quilts on the go so when I worked on one, I was pushing to get it done so I could finish the next one in the row. I wasn't enjoying the process to its fullest. An unexpected result was as I finished each UFO I got lighter. I got excited about what I was doing now and what I might achieve in the future. I got into the habit of finishing the quilts and began to stop the pattern of rushing into a new project. The original quilting design for Mariner's Compass has changed a lot while I was finishing other projects, I gave the design time to stew, marinate and develop. I felt free and joyful. As Leah says, taking the time to design and plan a quilt means you don't rush into it and create another UFO. And the other plus is that it allows you to mature a design. Buy yourself a lovely notebook, or in my case use one of the 14 I had lying around. And the experience you gain in finishing off those UFOs means that next quilt will be better, you will be more assured and skilled. Planning quilts this way means it is easy to change the design, much better then getting half way through a project and thinking "uh oh". Stop the cyle of UFOs and think how lovely it might be to only have one or two quilts on the go at one time. Think of rewards. Is there a special project you really want to do, can be a new one or a UFO on hold. Design it, review it, lust over it and be anxious to get going on with it but don't. The quilt will only be better for the wait. Or maybe you want a new sewing machine - hang it out there as a reward. Plan a special meal for when you finish each quilt. It can be anything. Don't be daunted by what is in front of you, the more you finish the more hooked you'll get on the experience and the easier and more fun it will be. Turning UFOs into FOs will become the reward. You can do this for everything. I did this with my lovely notebooks/journals. Collected every one - over 20! I gave away 8 of them. I didn't really like them for whatever reason and that was why I wasn't using them. I divided the others into groups, some for quilting designs, some for journal writing, some for work, some for study. And I made the vow that I would not, absolutely not, buy another until I'd used them all up. And I'll finish by saying that this is my experience. I don't expect everyone to want the same thing but for the first time in the 14 years I've been quilting I've given myself the time and space to really think about why I quilt, what it adds to my life and why I was getting sucked into a way of quilting that actually negatively impacted the way I felt about something I loved to do. 7th October - a small note here. It is tempting half way through the process to start feeling really smug with yourself and think "I have this beat" and start new projects. Resist, resist, resist. You have not beaten the habit until all are gone and you spend another 6 months making new projects and finishing them before starting on 12 others. One day at a time. You have such good thoughts about UFOs! I don't have many because it stresses me out to have them hanging around, but you've really put a lot of introspection and thought into yours. It was interesting to read. And that compass quilt is absolutely GORGEOUS. Thanks Christine. I actually put this plan into place about everything in my life towards the end of last year. I called it my "what if the clutter in my wardrobe impacts my ability to enjoy quilting" ah ha moment. So I tackled everything, books, papers, projects and found myself getting lighter and lighter by the moment. I am very proud of the compass quilt, thanks to Leah who gave me the bravery to just go for it. A very comprehensive article, well worth the read. This process started for me about 4 years ago, and I keep working on it. The first two years downsizing everything to prepare for retirement and a move into a 5th wheel. Now 18 months into living in the RV I am into another cycle of clearing out. In 2011 I only finished one project, now in 2012 so far I have finished 21. It feels so good. I have about 15 UFO's more, and have only started one completely new one, Leah's Wonky quilt top...but that is to improve my machine quilting. Even with all of this I gleaned about four new ideas from your post. Thank you! Wow you are going great guns. Glad I gave you some ideas. It took me easily 10 years to build up to this approach, did bits and pieces here and there but never focused on the why I hung onto stuff and what impact it had on me. Enjoy trying out the ideas and let me know how they go.